We are currently renting a beach house and one of the easiest ways to feed everyone is by grilling…. chicken or steak or burgers for the boys and veggies for me + adding lots of simple sides using the best local summer produce. 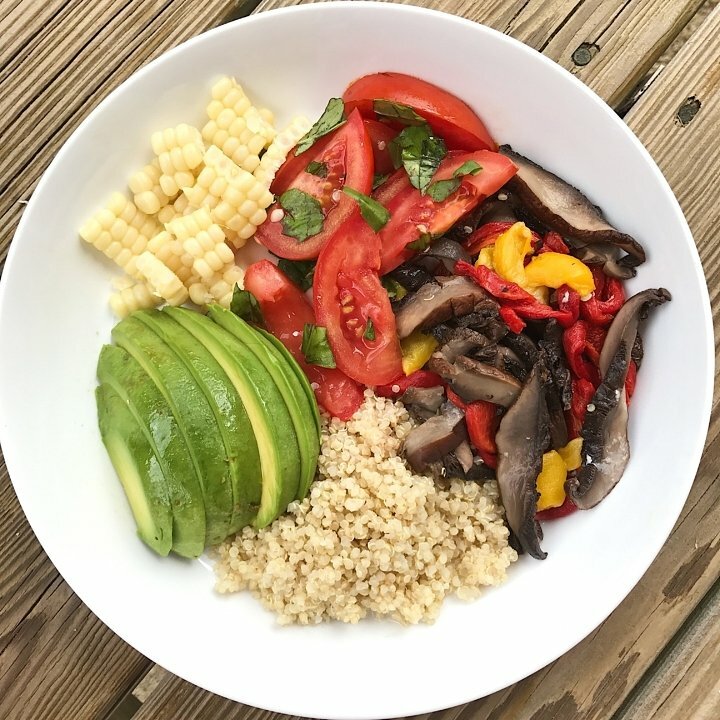 My bowl tonight was grilled portobello mushrooms and grilled peppers, Jersey tomatoes mixed with EVOO, balsamic vinegar and fresh basil, fresh Jersey corn, quinoa and avocado. Doesn’t get any simpler or yummier when the produce is so fresh and flavorful by itself. Tomato Salad: Fresh tomatoes (the fresher and more ripe, the better), EVOO, Balsamic vinegar, Lots of fresh basil. I don’t tend to measure when I make this salad — rather I add more or less oil and vinegar depending the sweetness of the tomatoes and tastes. My husband and I tend to love balsamic vinegar so I’m sometimes a bit heavy handed with it and love the contrast to the sweet tomatoes. Let me know if you’d like to provide measurements. Corn: We’ve boiled corn many ways. My mom used to place the corn in a cold pot of water and take them out when the water boiled and that seems to work. But I generally bring a large pot of water to a boil then place the freshly shucked corn in the boiling water for 4-5 minutes. That way the corn isn’t too soft. We actually only eat fresh corn during “corn season” and find it juicy and sweet so we don’t tend to eat with butter or salt though many others at our table enjoy it that way. Grilled Portobellos: Gently toss cleaned portobello caps in olive oil. Preheat grill at a medium high setting and place portobellos directly on grill for 15 minutes or until tender, flipping once. Slice and serve.